My son Ollie, was diagnosed with an “unusual” combination of acute lymphoblastic leukaemia (ALL) and acute myeloid leukaemia (AML)about seven weeks before his fourth birthday. His only symptom was a swollen testicle which I noticed by chance when he was playing in the bath. I initially took him to the out of hours doctor on a Saturday and we were called back to the children’s ward on the Tuesday for blood tests and a scan. We waited for what seemed like hours before I was taken a side and told that blasts had been found in his blood – he had leukaemia. We were blue lighted that night to the Royal Marsden in Sutton. Initially, the consultants were unsure which treatment regime he would follow due to the combination of ALL and AML, so he was fitted with a Hickman line. Ollie responded really well to treatment and at his Day 29, the Minimal Residual Disease (MRD) test showed that he was in remission. All leukaemic cells were gone so he was set to continue on the UKALL2011 trial that was funded by Children with Cancer UK. 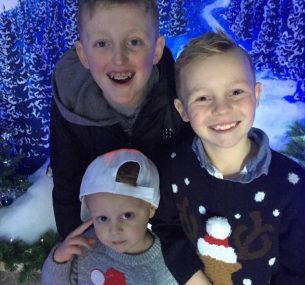 About five weeks into treatment, Ollie having not really eaten or drunk anything since treatment began, he was called back into hospital following abnormal blood results. They redid his blood, it showed he was suffering from kidney failure and his SATS were abnormal too. He was again blue lighted this time to St Georges in Tooting, where he was taken into Paediatric Intensive Care Unit. He had a blocked heart valve as well as kidney failure. He stayed in the Paediatric Intensive Care Unit for 48 hours and was then transferred to isolation at the Royal Marsden, which by this time we felt safe in the hospital. Ollie remained in Isolation for about 10 days and had a NG tube fitted in this time as he was still barely eating anything, his weight dropped to 10.5 kilograms. He was discharged and was home just in time for his fourth birthday. Ollie managed to stay home for about three weeks before being admitted to our local hospital with a suspected line infection. Blood culture results showed a highly resistant bacteria called Clebsiella in his blood. Ollie was transferred again by ambulance to isolation at the Royal Marsden and had his Hickman line removed whilst they tried to treat the infection with antibiotics. Fortunately for Ollie the infection was restricted to his line. Once that was removed his condition improved. Ollie was discharged on Christmas Eve, so we were able to spend Christmas all together at home as a family. On Christmas night we found out we were expecting a baby! 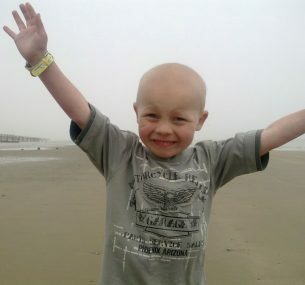 Ollie had a new line fitted in January and chemotherapy recommenced. He started eating and drinking and no longer needed his NG tube by March. Ollie spent much of the next four months in and out of the local hospital with infections, but once his little brother Stanley arrived in August, his health seemed to improve. Ollie started school in September and managed 87% attendance his Reception year. 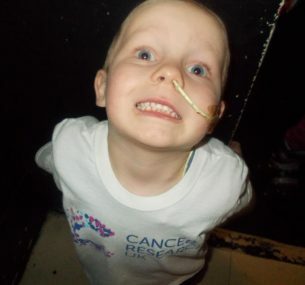 Ollie finished treatment January 2016, aged seven and two months. Ollie’s older brother Daniel had some art therapy for 24 weeks in 2015 to help him with his anxieties, he still fears when Ollie goes for check-ups. They now are able to have a normal brother relationship, argue, fight, wrestle, which is great. I try to put it all behind me but I am continually worried about the leukaemia coming back. Every time Ollie gets sick I go into panic mode. More recently Ollie has begun to suffer from anxiety. He worries constantly about not being perfect and getting things wrong. We are working with him to boost his confidence and self-esteem and help him remember what an amazingly strong and resilient boy he is.